StubbyDog is proud to announce that it is the featured rescue on Dressabull.com for the month of January. Dressabull.com celebrates the pit bull type dog and offers dog clothing, accessories and toys all tested and approved by pit bull type dogs. You can feel good about shopping their store too, as 10% of each purchase goes to a 501c3 pit bull friendly organization of your choice, and this month it’s StubbyDog! Also, StubbyDog supporters can enjoy 15% off any regular priced product by using coupon code STUBBY0112! So shop for you pit bull and support StubbyDog and enjoy a discount too! What could be better? The picture in the top right corner of your page looks exactly like my girl, Jersey. If I didn’t know better, I would think someone had sent you her picture. 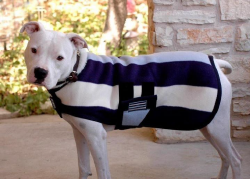 This is wonderful what Dressabull is doing to help pit bull organizations. I will definitely be shopping their website. And a bit CONGRATS to Stubby Dog for being chosen for January. Yeah!!!!!!!!!!!!! @Jerseysmom Thanks, we are thrilled to be chosen this month.